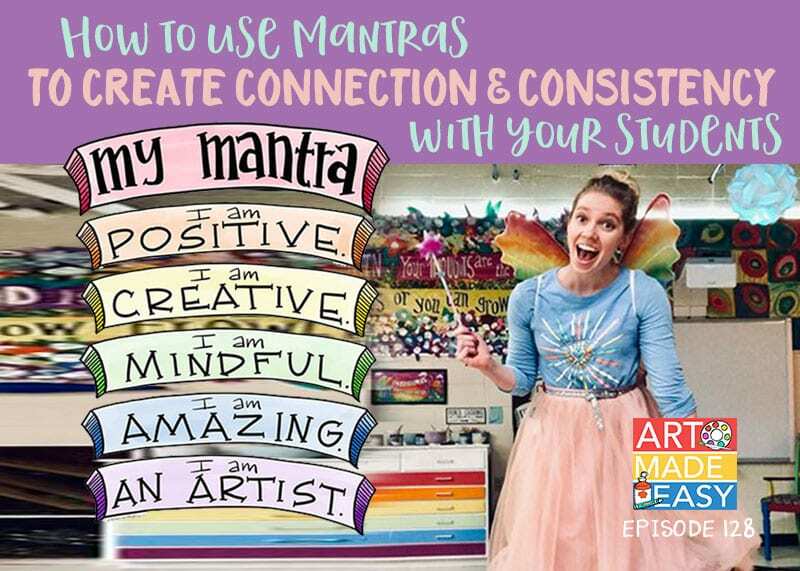 Looking for a fast art project to do with your students? 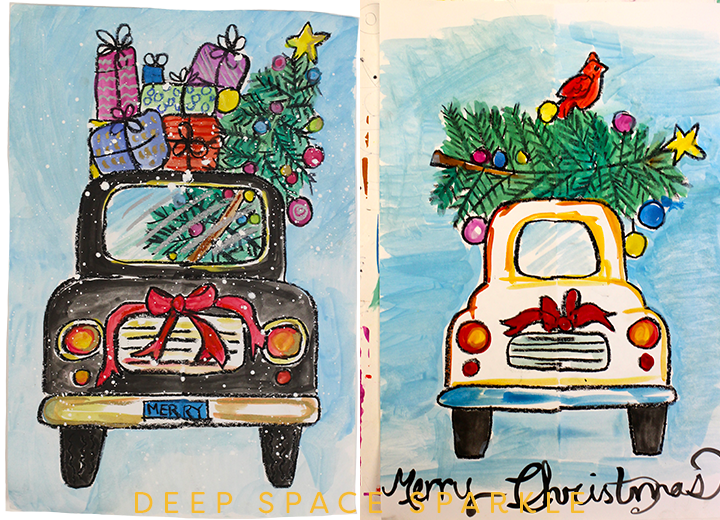 This cute Christmas car is quick (two @ 45-minute sessions) and full of art techniques: symmetrical drawing, tints, reflections and perspective. 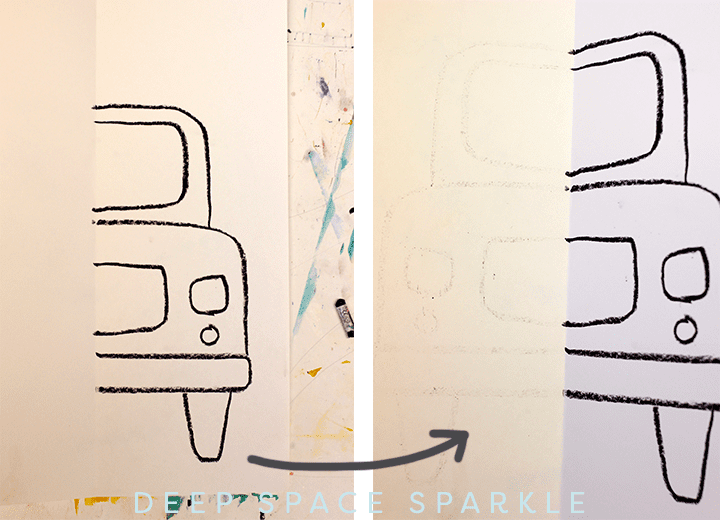 Make sure to use a black oil pastel and not a black crayon when drawing the car or else the lines may not transfer. Fold paper in half vertically. Use a black oil pastel to draw. It will transfer its color better than a crayon. On one side of the paper, draw a narrow rectangle. This is the fender. Below the rectangle, draw a wheel. It is shaped like a slightly curved rectangle. Draw a circle for the head light. Draw a rounded corner rectangle for the grill. Draw the side of the car. Draw the roof of the car. Fold paper over and press with palm of hand. Rub back side of paper to transfer black oil pastel markings to the opposite side. Open up paper to reveal faint tracing. Trace over lines with oil pastel. Use cake tempera paints to paint a background and the details on the car. Cake tempera is much like watercolor paints but are more vibrant and intense. I like them better for this project because the paint will not cover up the lines like liquid tempera will. Select ONE color of paint and mix with white. This creates a TINT. The tint allows the details in the car to stand out. 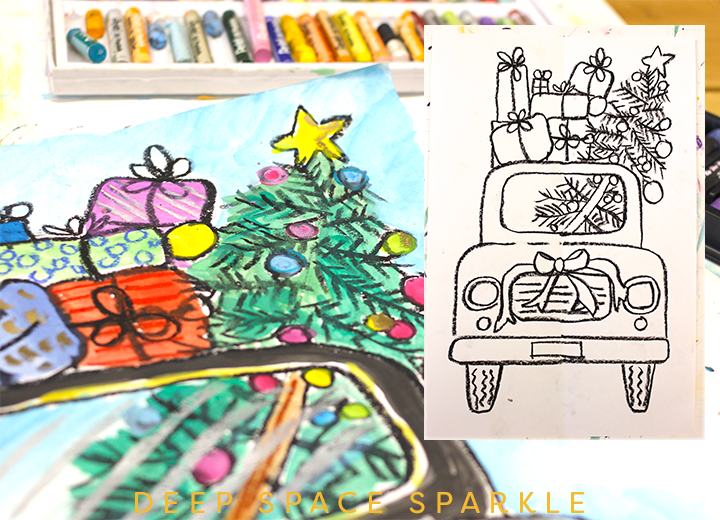 While children should choose their own color, discuss what colors will work with the drawing so that the Christmas car will be the focus. 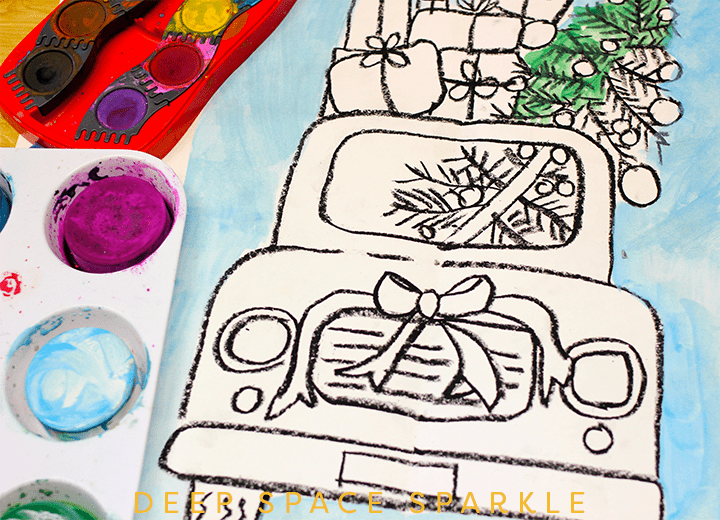 Once the background is complete, the children can begin painting the car, tree and decorations. This is the time to let children go wild! Pick their own colors, dream up a fancy car color and add festive details to the top of the roof. Once the tempera paint has dried, it helps to trace over any lines that are hard to see. This is also a great time to use colored oil pastels to add details. I used metallic gold and silver pastels to add stripes on the gift packaging. Children may want to add a string of Christmas lights, etc. 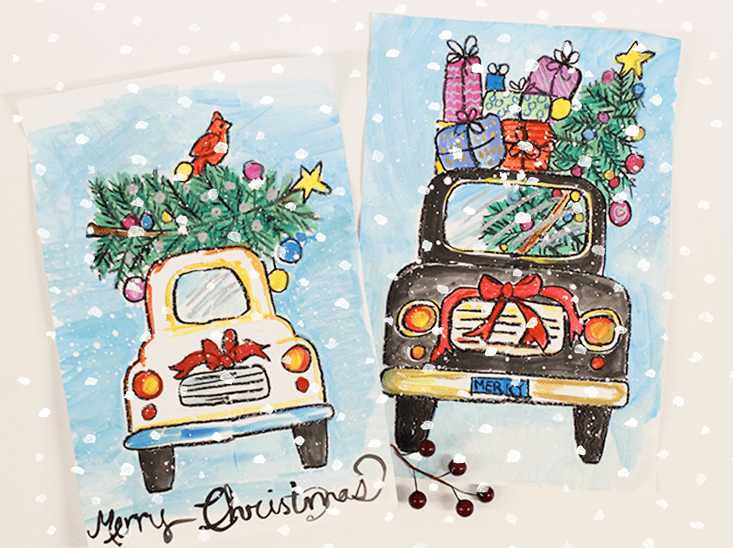 I can’t wait to see each of your students personalized Christmas car! 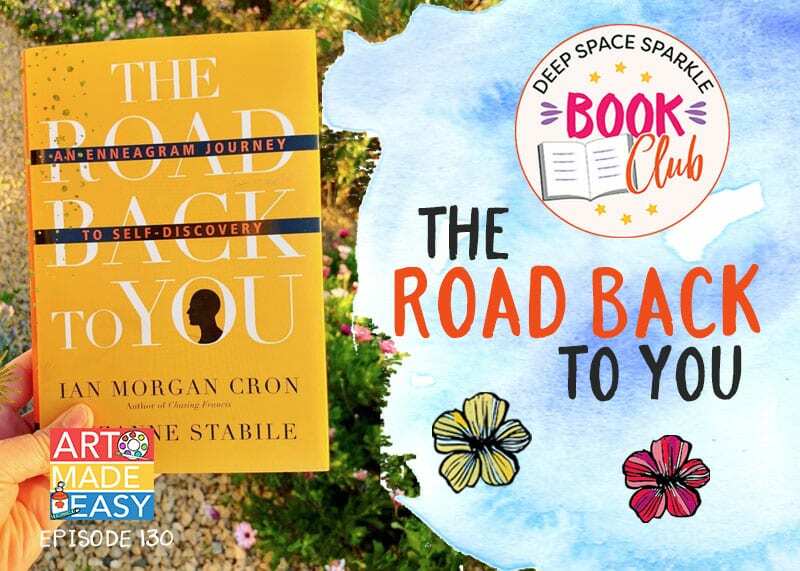 Share your results on the DSS Facebook Group or if you are a Sparkler, the private Sparkler Facebook Group. You are a genius and a life saver. I am a substitute teacher and having a bag of these quick projects have saved my sanity on more than one occasion. Love this! Got to have for the grand kids. SO ADORABLE!! Great fill in project before break!! Oh how I love this whimscal drawing, thank you for sharing and I showed my 5th graders and they are so excited to draw this! This is a fun and different take on Christmas art that boys especially will love doing. Well thought out and the folding teaches them symmetry. I like it very much. Can’t wait to try it out! I LOVE this project! Hopefully the older boys, especially, will enjoy doing a Christmas Project related to cars/trucks. Wow! My students saw this on my computer and are so excited to give it a try! Thanks for sharing! 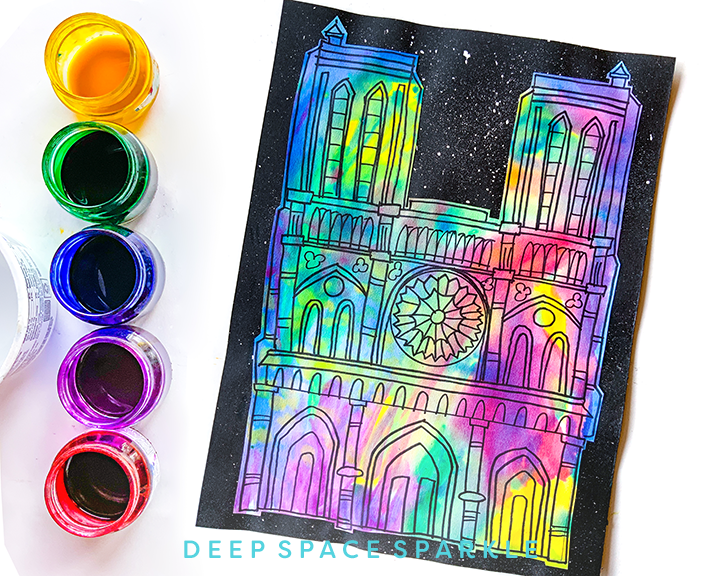 Beautiful little paintings! Great for gift giving! Thanks so much for sharing! 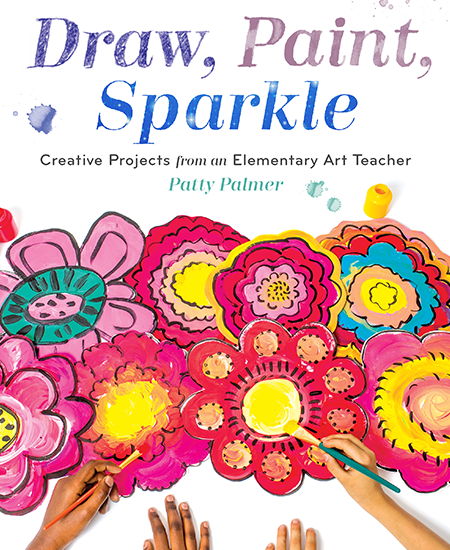 Another wonderful, colorful, creative project that turns everyone into an amazing artist! Carolynn Peters, I teach art in Budapest Hungary too 😉 small world! So excited to do this next week! Thank you! Thanks for this great project! Will have to try next week! I love this lesson! I can’t wait to do it with my students. They are going to love it! Thanks! I love this car lesson. Please email me the hand out. You understand the pressure teachers are under and your lovely little projects, like this one are such gems. With so much learning shared for great lessons to use when the brain is fried. 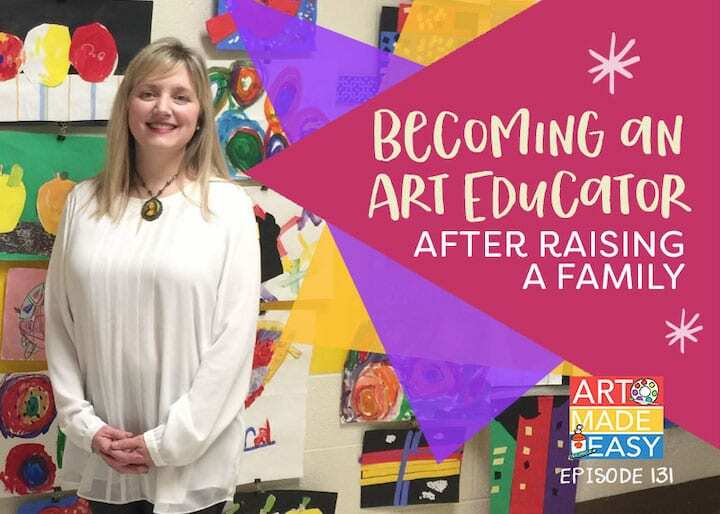 I so appreciate it, as a new teacher wanting to the best for my students and art is not part of my curriculum, but I believe it is such a valuable medium for learning. What a fantastic resource your site is! I’m a retired science teacher. Students were required to draw quite a bit in my classes especially if they weren’t able to express themselves clearly in words. I love the way you give directions, so clearly and concisely. Can’t wait to give this a try with my family! Thanks a million! Thank you so much! Having taught art long enough helps you to understand what to say and not to say! I would be interested in pdf of this drawing lesson. Very cute and perfect for a greeting card for the parents. I love the symmetry fold technique. Sometimes it is tough for artists to paint up to an object. My thought would be to paint the paper with the sky BEFORE drawing the car. Another strategy could be to use water colors for the sky before the car is drawn. Totally loved it! Thank you so much. Merry Christmas !! i love it!!! Thanks for sharing!!!! I absolutely love this! Although I don’t celebrate the holidays, I figured I can modify this project for summer and draw suitcases on top of the car for a summer vacation trip. So cool! Cue idea! I may use it before summer break….’Where’s ur family traveling this summer? Or… where would u like tp go? ‘ since not all my students get to go on vacations, except in their imaginations! 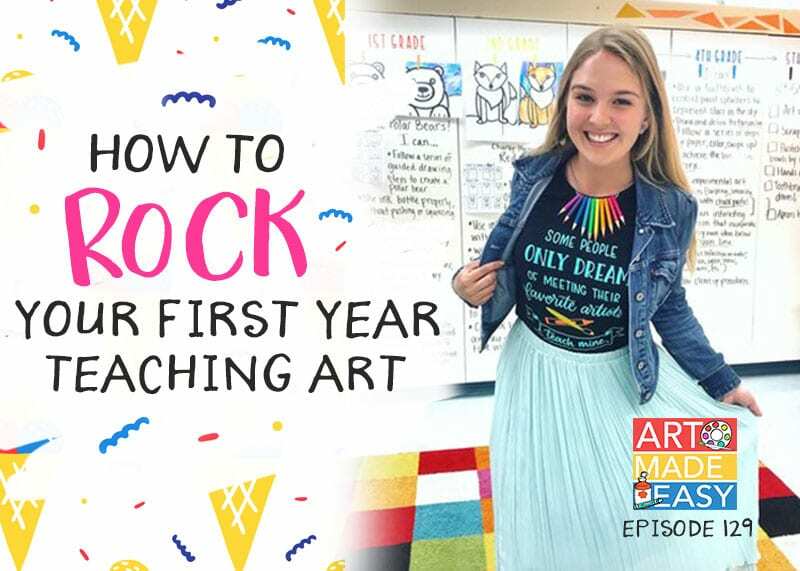 I am so excited and can’t wait to introduce our Christmas Art Project to those students participating in the 2018 Christmas Art Academy at Mt. Zion Baptist Church! Thank you so very much for sharing your ideas and art. 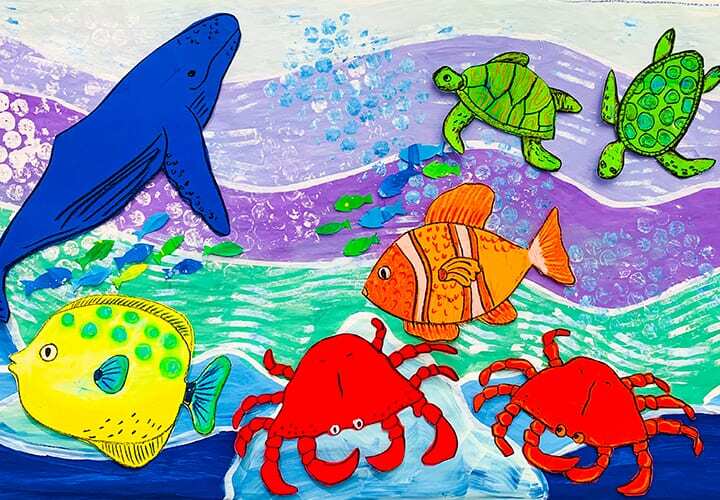 I will also use this image for our art project for the children who will remain patients at the hospital (Pomona Valley Hospital Medical Center) during the holidays! It is an answer to my prayers as to what will be the primary basis of our Christmas card this year. Thank you once again! this is so cute! 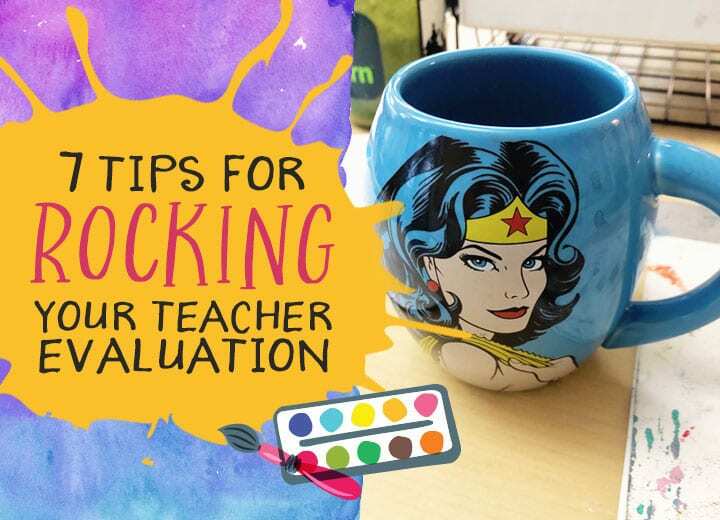 Can’t wait to try this with my students! How did you create the snow falling in the black car image? I have done the flicking with tempera or acrylic before, but looking at a 2nd to 3rd grade age range for this, so not sure I trust them for that yet, haha. Definitely trust them! 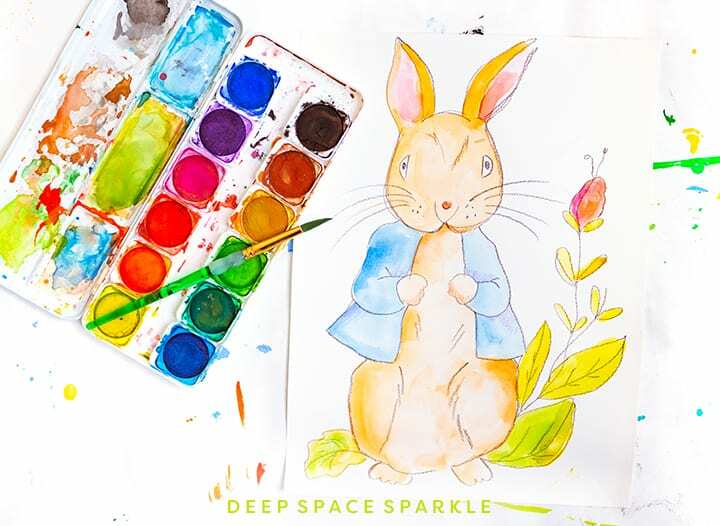 It’s so fun…one trick I have is to show the children to hover their paintbrush about 2-3″ above their art work…then tap, tap, tap with the other hand. The close proximately to the paper reduces the massive mess. It helps to demon the proper strategy for them. Did this last year and my students LUVED IT! I was so pleased with their enthusiasm and creativity. They really ran with it!